ColecoVision.dk Presents: The ColecoVision Video Game Console. What Is A ColecoVision ? The New Generation Video Game Computer System. Arcade Quality Sound And Graphics. in genuine electronic arcade games. Good sound and graphics are essential features which make arcade games so challenging and enjoyable to play. 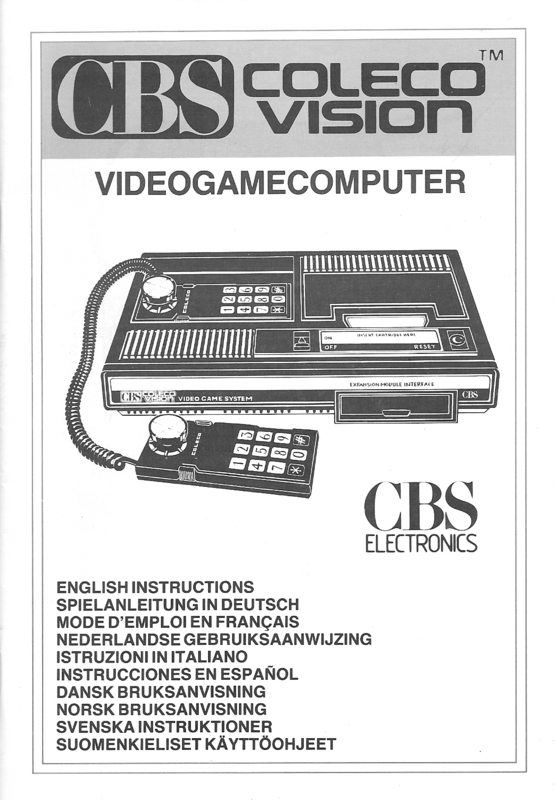 Now these outstanding features are available in your own home with CBS ColecoVision Video Game Computer System. A Wide Range Of Super-Charged Games. CBS ColecoVision has lot of challenging game cartridges which are faithful copies of the arcade favourites. containing the ultra powerful 24K Rom chips. detail and challenge in every cartridge which will test the most skillful video game expert. arcade game experts for the original arcade games. To get the best from each game you need fast, responsive easy to handle controllers. 2 independent fire/action buttons and a 12 digit push button keyboard for game selection. Expansion Capability For The Future. expanded to perform other uses. At this time two expansion Modules are available with the third, a powerful home computer, close to completion. Expansion Module No. 1 allows you to play all Atari VCS compatible cartridges on the CBS ColecoVison console. This unique adapter gives access to the widest range of video game cartridges available. comes with the Turbo video game cartridge. CBS ColecoVision game console (32K Rom;16K Ram) and converts into a powerful home computer. 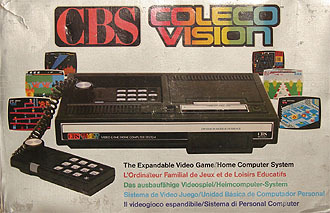 to expand the CBS ColecoVision console to fulfil many future needs. The whole adventure began above. Note the spinners, the blue push buttons, on/off and reset (horizontal). The and # are presented in orange color. Colecovision was in the 1982 until around 1985 the biggest gaming console ever. ColecoVision was an Arcade machine just for your home, designed by Texas Instruments and manufactured both in USA., Hong Kong and Taiwan. The Colecovision is essentially a stripped MSX1 and very close to SpectraVideo 318. ColecoVision is related to all home computers and consoles with the environment around Z80 and the graphic chip 9928. ColecoVision has a cartridge slot, 16 kb video RAM, up to 32kb ROM and 1kb RAM. So games written for the colecovision could easily be ported to the MSX, but the other way around proves to be more difficult (but is certainly possible as well). Atari, Mattel and Philips do not have the same high resolution graphics like ColecoVision. Intellivision was even better than Atari 2600, and Atari better than Philips/Odyssey. But what was it there could make ColecoVision so popular back in the 80's ?. Popular movies at the time was: Scarface, StarWars, WarGames, Flashdance, Trading Places Jaws 3, Superman 3, Christine, Dirty Harry and many more. was so you could play your favorite games like Donkey Kong, Pac-Man, Pole Position, Qix, Popeye, New Rally-X and maybe Lady Bug. These games was in that time very popular and the people there played on these machines was completly obsessed. You was "a kind of obsessed", -maybe you could make a record, and then get your initials on the screen for the rest of the day, or even "forever". There was earned big money up around the 80's on these Arcade machines, just like the old fasion slot machines. A big part of these arcade machines was build up around the CPU: Z80A, and the same CPU chip is build inside of the ColecoVision. Zilog's popular CPU Z80A, was an 8 bit prossesor that saw the day of light back in 1976, with around 4 MHz. of speed. Z80A are close to Intel 8080/85. A good thing was that the Z80A could generete own RAM signals. The first Z80=2,5 mHz. Second version Z80 A=4 mHz. Third version Z80 B=6 mHz. and Z80 H=8 mHz. The popular Hitachi HD 64180 was also close to Z80A, and had even MMU. A coin-up for an arcade machine fill around 40 x 40 cm. E.g. : "Moon Patrol" 3 pieces of a PCB: 37 x 42 cm. +1 piece of: 37 x 16 cm. This game PCB filled with chips was in an Arcade machine way back in 1985. -But a cartridge for ColecoVision is only around 10 x 8 cm. and include a PCB with only 2 or 3 chips. Remember an arcade machine could have the same CPU, for data, but it could also have it for working sound. Arcade games had also a very large and a different way of chipset to be able to run such a game of this size. So limited chips for a ColecoVision game had therefore some limitation in the gameplay for ColecoVision. Even on the ColecoVision game pack was a textnote: -"Just like the real arcade game"- Well, you most realize that it was a different game you played, but many are close to. ColecoVision and the Adam had the core and was close to SpectraVision 318, and both was the precursor for the later MSX adventure. Why are they so close and yet not anyway, since MSX, as we know came straight after. SpectraVideo 318 was an unfinished MSX homecomputer like ColecoVision and the ADAM Family Computer. 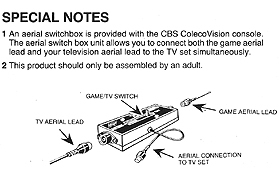 The differents was Coleco's own restrictions. They made ColecoVision as cheap as possible, so no easy multicolor, and flicker was a big problem. Coleco's gamedesigners was reminded to remove all unnecessary things that could prevent the game to fill to much. Characters og backgrounds was simple, and the logical gameplay was changed, and we know now we can blame the ColecoVision graphic chip for that. 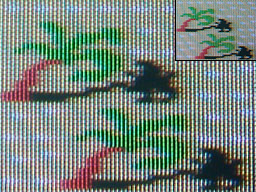 Coleco would and could not get close to an arcade machine, neither on memory, 80's resolution and colors. A ColecoVision Graphic chip could only handle 15 colors, 1 transparent and had in no way a scrool or vector generator built in. Also the design inside on the PCB, components, and the way the console are built are a limitation in itself. Coleco's own graphic designers was not even able to program a nice smooth scroll for Colecovision. But it could the people from 3rd Party companies like Imagic and AtariSoft, with their games like: "Nova Blast", "Defender" and "Moon Patrol". Differents in the games design was that, allmost all the arcade machines had a vertical monitor, while a tv screen is horizontally. So it was a big work for the graphical designers at Coleco to redesign it all from scratch, and there was no time for a Coleco employer to take a break. Coleco released a lot of games, so they decided in 1983 to outsource some of them to other companies. A cartridge for ColecoVision was before up to 32 K. ROM and in the 80s was those chips very very expensive. Today 128 K. for the first homebrew Pac-Man Collection, and now even up to 256 K. is not uncommon today. MegaCart1 from Opcode Games can provide up to more than 1 mb. ColecoVision is today more powerful than ever. You still have your old 80's ColecoVision if it still works. But you can now add a Super Game Module with extra RAM and one more Sound chip. You can also add an very avanced AtariMax SD Cartridge with a SD card reader. You can also add a Graphic Card with VGA out, and newest MK II can handle HDMI. New is also Super games that can store settings and save high-scores in the cartridge without batteries. After Coleco say stop for further games in 1984 and the game market general in U.S. failed in mid 80's, was there still many unreleased ColecoVision games on the market. Many games was hastily completed, and the last hit the market in 1986, but the screen says 1984. Konami Industry has short after a big sale outside U.S. for the MSX platform. Homebrewers in USA and Canada can now, thank god convert these games so they can be played on ColecoVision today. The company Konami is around, but not our beloved ColecoVision, it will only die slow. The problem with our ColecoVisions is the lifetime, it's limited by the range of components which many of them have left the world. So latest news is 3 new ColecoVision consoles will see the daylight. CollectorVision Games will release their Phoenix console in 2019 and HB Vision, also in 2019. But Opcode games will publish its Prometheus Lite version in 2020. 2 of these consoles will be emulated and 1 is dedicated chips, this will keep alive the many games around the world quite. And remember there will still be produced games even today. This is one of the original Coleco Brands from the former company Coleco Inc. The Brand is not the oldest. Games an Console in Europe was licensed under CBS Electronics. The common name was ColecoVision. My serial for my 1st. one. And # 2. And here number 3. This is from july 19th 2010. And the newest from October 02, 2018. All my CBS Consoles are made in Hong Kong/China. 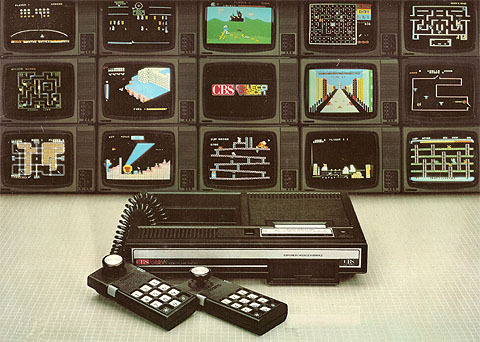 Promoted advertising: CBS ColecoVision Europe. the world known, namely Donkey Kong. One of Nintendo's biggest hit ever. was ColecoVision not necessarily with Donkey Kong. A Pac-cheese look-a-like game was included instead. And in Denmark an Italy was Mouse Trap included. The Official Instructions book for Europe. The book are including 10 languages. The originally power supply was big and heavy as a rock. It's said that the U.S. version of the power supply easily can break. They have a plug in version. not have a lead at each end of the power supply. Zaxxon - Space Panic - Carnival - Gorf - Looping - Pepper II - Space Fury. 2 x female and 1 x male. Graphic Processor, 8 bit. 10,7 mhz. TMS9918A 60 Hz. NTSC. No RGB. Only Video Out. TMS 9929A 50 Hz. with Y Pb Pr for RGB encoding. For PAL up to 313 lines per frame. French version has RGB output via Scart connector. Sprites up to 32 Simulated, max 2 moving sprites per scanlines, flickering. Text on screen 36 characters a 24 lines, and 80 characters for the ADAM Computer with a Monitor and a Hardware card. Cartridge ROM 8 K -16 K -24 K -32 K as standard. Output signal 2 channels RF Coaxial / F - Connector for U.S., and 2 channels HF Coaxial / DIN Connector for Europe. 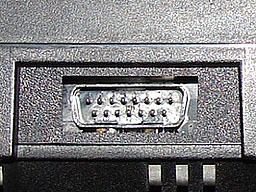 Direct RGB Scart connector for France. The ColeVision console had a 12 seconds delay that irritated many people in USA, and people were irritated about having to wait so long for a game to start up. The real reason behind the 12 seconds delay is a loop in the ColecoVision Bios, the delay was purely intentional. Eric Bromley at Coleco felt that 12 seconds was appropriate for the copyright. Some companies like Parker Brothers, Activision, Micro Fun and all newer companies avoided this delay by simply bypassing it in the Bios. In Denmark, Australia and other contries in Europe we don't have the 12 seconds delay, only 4 seconds. On the right do you see my very own box from 1983. I found the box far behind in my basement room, which I also found the box for the Roller controller. 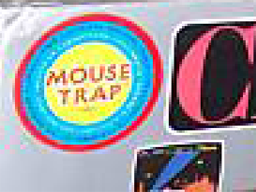 The Mouse Trap sticker up left is fallen of over the time. On the picture left, you'll see where the label would have to sit. When and if I find the receipt on the purchase of my CBS ColecoVision, will also that be posted. This is my very own and 1st. CBS ColecoVision on this picture. The adhesive wood effect is placed by me in 1984. And was inspired from 80's VCS 2600 and Intellivision. 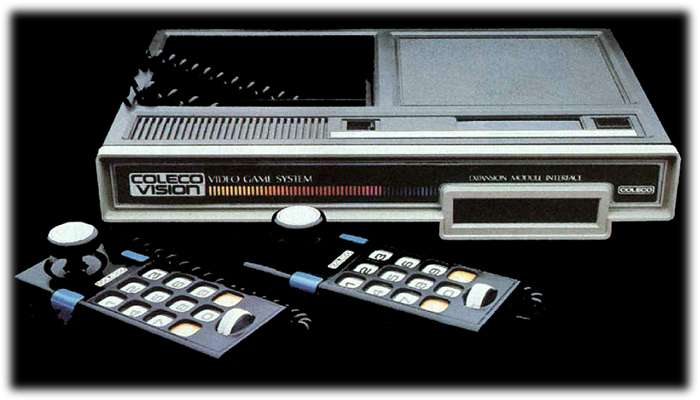 My first ColecoVision was a CBS revision printed 1983 with a U.S. board inside. Then 3 ColecoVisions in various revisions, and finally end up with the French version. So my 5th board is a French REV. B # 91209 from 1983. And my 6th French ColecoVision board from October 2018 is a REV. It's the best CBS ColecoVision on the market at all. ( 9929A + RGB ). The adhesive wood effect is still on my ColecoVision, I just change the upper half every time I get a new ColecoVision. Many out there have tried to emulate it with varying results. But this one, is the one and only. Official Coleco Péritel or SCART TV cable, allows you to get the better quality of sound and picture through the RGB signal. 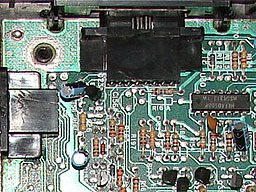 Scart avoiding much more interference or noise, typical of the RF-Antenna/RCA/F lead connection. 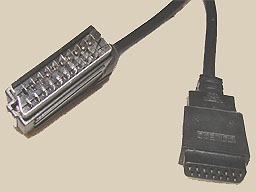 Very few CBS Colecovision consoles were sold including this SCART lead, because in that time the SCART Connection had not become a standard on ColecoVision yet. The French standard was originally designed in the 70s, under the name Péritel. U.S. call it EIA interface, and many europeans call it Euroconnector, but Scart is a kind of common name. This standard is more than common in Europe than in the rest of the world, in which commonly used the famous yellow RCA phono plug. Therefore, these may well become confused about what is AV in Europe and what is the AV in for example in USA. 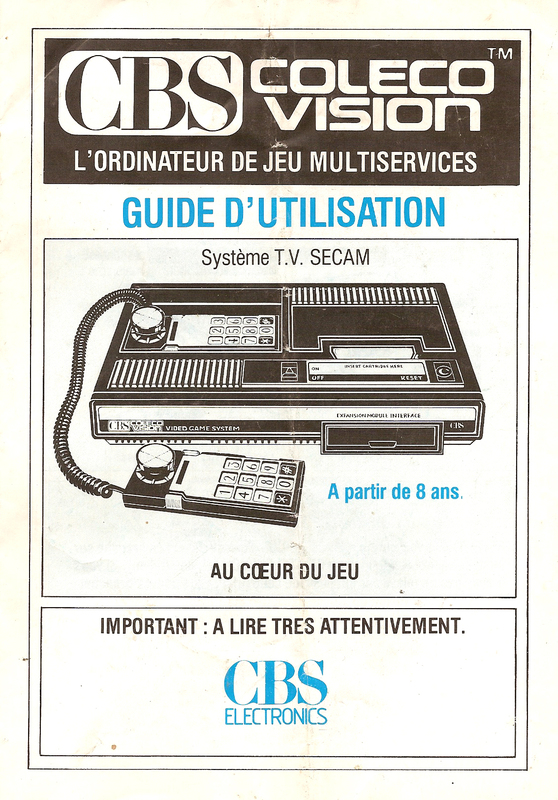 The french CBS ColecoVision version with Scart output was the last production for the market. In U.S. and Canada was the production already stopped, but the stock end was still crowded. 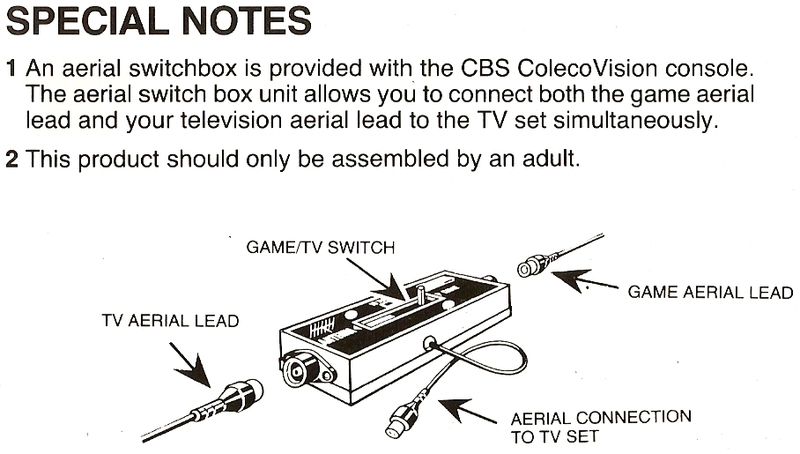 As Coleco sold out of their units were surplus of perhaps some boxes from the CBS production, therefore, the last consoles sold with different body content and various manuals. But the French version should be original. "This console is almost 30 years ! A true collector very rare in France. It worked well in the world 6 million copies, huge for the time, but it was sold only six months in France." Look at these Palms in Road Fighter with RGB on a old Tv. And Bump 'n' Jump with RF on LCD, and with RGB on LCD.